Lenovo is hardly a new name in the computer industry, as they're one of the top five PC OEMs in worldwide sales right now. In fact, Lenovo was keen to point out in our briefing that they're now ranked number two in the world as of last quarter, having jumped from the number four spot just two quarters prior. Lenovo has been the fastest growing PC OEM for the past ten quarters, and last year they announced a joint venture with NEC to help break into the Japanese market as well as acquiring Medion, a European company. Those two items are part of the reason for their rapid movement into the number two spot. 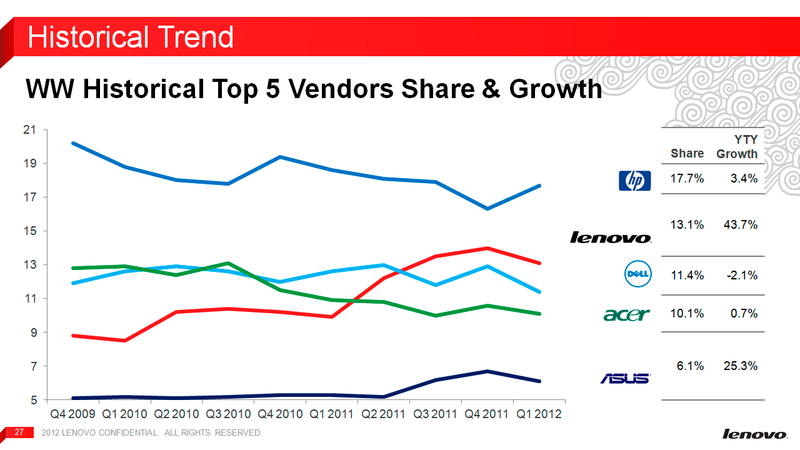 That leaves just HP ahead of Lenovo, and naturally they would love to claim top honors. How they intend to do that is part of today's announcement. 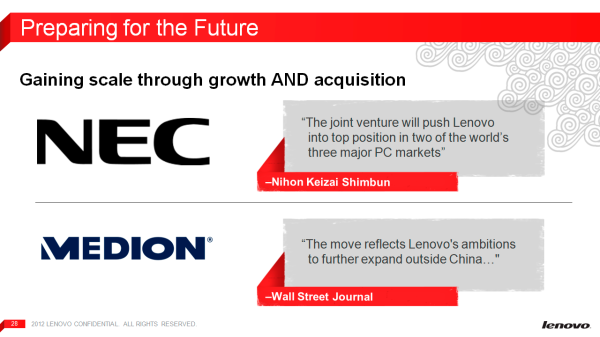 Like all the major PC companies, Lenovo has a widely diversified product portfolio. They’re probably best known among our readers for their ThinkPad laptop brand, which they purchased from IBM about eight years ago. ThinkPads have been a staple among business laptop users for a long time, with a reputation for build quality and reliability. Since purchasing IBM's PC business, Lenovo has been adding various other brands and products, and we'll be looking at a couple new additions to the IdeaPad line today. Lenovo also has their ThinkCentre all-in-ones, ThinkPad and IdeaPad tablets, and even smartphones. While we didn't get specific numbers on the breakdown of sales, Lenovo did indicate that a large portion of their increased sales has come in their consumer oriented IdeaPad line. The second item to discuss before we get into the product specifics is that Lenovo like many others is putting a lot of effort into Ultrabooks. Intel has stated that they expect up to 40% of their sales to come from the Ultrabook segment by the end of the year. That's a huge percentage, considering Ultrabooks officially came into existence just last year—though of course ultraportables have been around for much longer than that. Lenovo isn't quite so bullish, but Lenovo does project that they will sell up to 20% of their systems as Ultrabooks by the end of the year, and 30% by next year. To that end, they’ll have Ultrabooks in various flavors for the consumer market, S&B, enterprise, etc. It’s not just about building new hardware, though. Lenovo is kicking off a major $60 million worldwide marketing campaign with their new Ultrabooks, the biggest marketing campaign in their history. They’ll be using a variety of print, TV, and online media to hype up their products, and you can view the first of their efforts with their Seize the Night video. As history has proven on numerous occasions, building a better product doesn’t always mean you come out ahead if the other guys have better marketing. And with that out of the way, let's discuss Lenovo's two new consumer Ultrabooks and what Lenovo is doing to make these new offerings stand out in a crowded market. 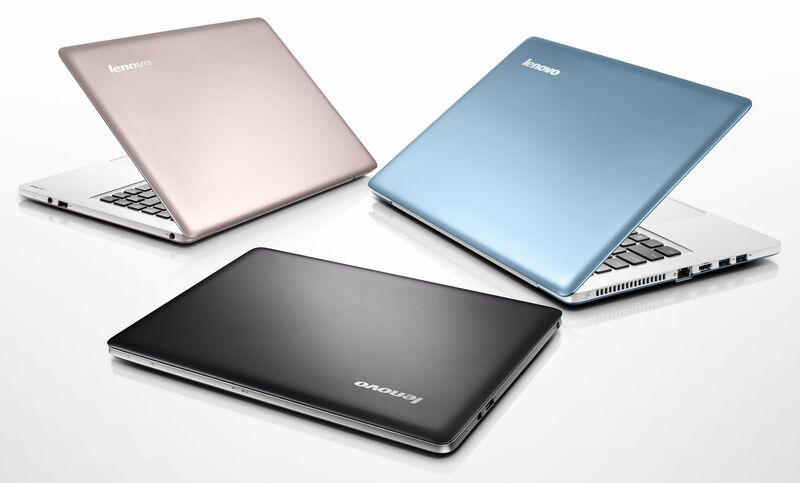 Today Lenovo is launching their 13.3" U310 and 14" U410 model Ultrabooks. One thing that Lenovo hopes will gain a lot of attention is the starting price points: $749 for the U310 and $799 for the U410. That's quite a lot less than the more common $999+ price tags we've seen with first generation Ultrabooks, but there are reasons for the lower prices. Let's start with a quick overview of the specs. While the specifications cover a broad spectrum of performance options, it's worth noting that the U310 $749 and U410 $799 models come with somewhat stripped down components. The CPUs will be Ivy Bridge Core i3, and they'll come with hybrid HDD+SSD storage solutions. Higher end configurations will of course be available, including U310 Core i5 and U410 Core i5 options (and Core i7 as well), but storage on these IdeaPad Ultrabooks—at least initially—will all be hybrid solutions. There will also be non-Ultrabook models that ship without an SSD cache, which seems like a waste, and some SKUs will even have the option for a last-generation Core i3-2367M processor. Note that the Core i3-3217U now runs at a steady 1.8GHz, which is a healthy step up from the Sandy Bridge Core i3-2367M (1.4GHz); if the lack of Turbo Boost support bothers you, though, it's only about $35 more right now for Core i5 models. Most of the other specs aren't all that unusual, with a couple different RAM options. What is a bit out of the ordinary is that Lenovo will be using SO-DIMM slots for the memory—most Ultrabooks that we've seen up to now have had the memory soldered directly onto the motherboard. Even more unusual is that the U310 will have just a single SO-DIMM slot, so it will sacrifice dual-channel memory and some performance in order to provide a bit more upgradability. The LCDs on both models are anti-glare, which is useful for any laptop you plan to use outdoors, though resolution remains at the standard 1366x768. Besides being larger, the U410 has another advantage relative to the U310 that accounts for the price increase. Where the U310 will have to make do with the integrated HD 4000 iGPU, the U410 includes a discrete GeForce GT 610M GPU with NVIDIA’s Optimus Technology switchable graphics. Normally I wouldn’t be all that impressed by the GT 610M, but considering the performance of HD 4000 when it’s limited to a 17W TDP—shared with the CPU—the 48 CUDA core GT 610M ought to be a decent step up in performance. Plus, it doesn’t have to worry about the CPU 17W TDP. We saw with our Ivy Bridge Ultrabook that HD 4000 in a 17W TDP doesn't always give as much performance as it does in a 45W (and presumably 35W) TDP. If you're the type of user that wants the ability to run games on your laptop, the U410 configuration should be better able to handle such tasks. 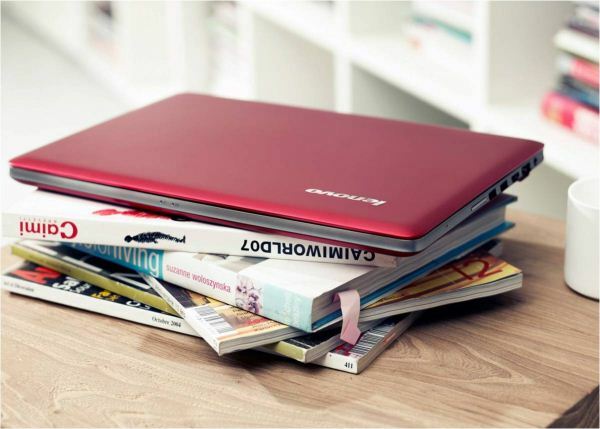 Another item that Lenovo is touting with their new Ultrabooks is a "textbook style chassis"; what they mean by that is that the U310 and U410 both have a uniform height, which makes them fit in with textbooks a bit easier. HP's Folio 13 and Dell's XPS 13 both took a similar route, though unfortunately we still encountered some alarmingly high temperatures. Hopefully Lenovo will do better in that area; we'll find out if/when we get some review units in for testing, though at least with the U410 the fact that it can support a discrete GPU suggests it can handle the heat. Along with their uniform Z-height, Lenovo will also offer the U310 and U410 in several colors to stand out from the silver brushed aluminum crowd, including Sapphire Blue, Aqua Blue, Cherry Blossom Pink, Graphite Grey or Metallic Red. On the software side of things, Lenovo also has a couple useful utilities that can help keep your system feeling responsive. BootShield for example allows you to specify what software loads at startup, delaying the loading of other apps and utilities until you’re already at the Windows desktop and helping to keep boot times low. This is particularly useful after you’ve installed a bunch of other software that might bog things down. This combined with their Rapid Boot technology allows for boot times under 10 seconds, including POST time, which is amazingly fast, particularly with an SSD. If there’s one concern we have, it’s the nature of the storage configurations for the U310/U410. An SSD cache can certainly help, but there’s no beating a pure SSD installation, and if some models ship without the SSD cache and with a HDD, expect the user experience to suffer. The new U310 and U410 Ultrabooks go on sale today at Lenovo’s website, and you should be able to find various models at the usual suspects—Amazon, Newegg, Best Buy, Office Depot, Staples, Fry’s, etc. in the US, with plenty of worldwide retail and online partners as well. What is it with any frugal retard who thinks 1600x900 is "hi-res" (sic!)...? 1366x768 is a complete joke, even on a 13" screen. Hell, my 10.1" tablet is higher DPI, and even IT looks like crap! Power users and software developers like myself need higher resolution displays, because software does not scale up/down very well. We aren't at the point of having resolution-independent software yet, despite attempts from Microsoft to make a compatible UI framework (Windows Presentation Foundation / WPF). When will hardware manufacturers GET WITH THE TIMES? This is friggin' 2012!